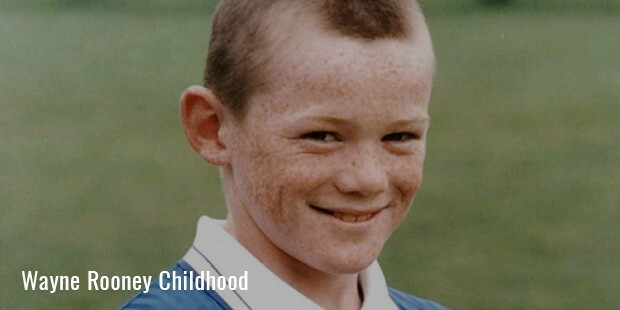 Wayne Rooney was born on October 24, 1985 in Croxteth, Liverpool. He was a big fan of football at a very young age and supported his local club Everton. He began playing for Liverpool Schoolboys and impressed one and all by scoring goals in heaps. He was soon spotted by Everton scout Bob Pendleton. Rooney joined Everton at the age of nine and scored 114 goals in 29 games for the Everton Under-11 team. By the age of 15 he was selected to the Everton U-19 team. In 2002, he went on to score eight goals in eight matches on route to the FA Youth Cup final. Rooney got to make his debut for the senior team on 17 August, 2002. His scored his first goal against Wrexham on 2nd October, that year. He became Everton’s youngest ever goal scorer at the age of 16 years. On October 17 he scored a last minute goal against Arsenal which broke their 30 match unbeaten streak. 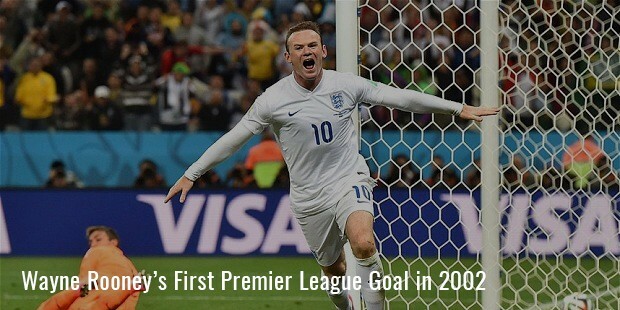 This goal brought in lots of appreciation for Rooney and brought him into the public spotlight. His debut season with Everton was very impressive with him scoring 8 goals in 37 matches for the club. Rooney signed a professional contract with Everton making him one of the richest teenagers in the world. The next season at Everton was also filled with some great performances by Rooney. This had made some of the richest clubs in the world interested in purchasing this teenage football genius. Newcastle offered £ 20 million which was a huge amount but Manchester United closed the deal by paying £ 25 million and securing the services of this rising superstar of football. This was the highest fees ever given to a player under 20 years old whereas Rooney was only 18 years old. Many felt that this was a high price for such a young player with only little experience. 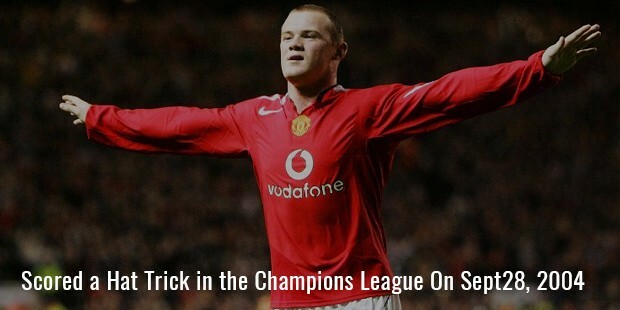 But Rooney answered his critics by scoring a hat-trick in his debut match for Manchester United in the Champions League. He became the youngest player aged 18 years and 355 days to score a goal in the Champions League. His first season turned out to be a huge success as he became the highest scorer with 11 goals. He also went on to win the PFA Young Player of the Year Award for his debut performance. But his team was unable to win even one trophy that year as the best they could achieve was a third place finish in the Premiership Title Race. In the 2005-06 season, Rooney scored 16 goals in 36 games but still his team could only come second in the points table. 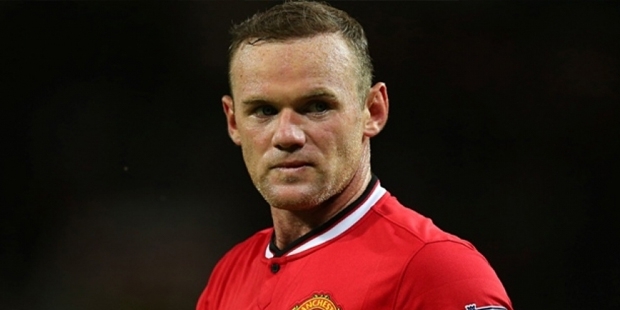 In 2006-07 Rooney scored 14 goals and helped his team win the Premiership Title. In 2007-08 he continued his scintillating form and helped him team win both the Premier League and the Champions league by contributing 18 goals throughout all competitions. In October 2008, he appeared for the 200th time for his club Manchester United. Again in 2008-09 he contributed 20 goals and helped his team win the Premier League for the third time in a row. He was also instrumental in helping his team win the FIFA Club World Cup in 2008 and the Premiership title in the 2010-11, 2012-13 seasons. 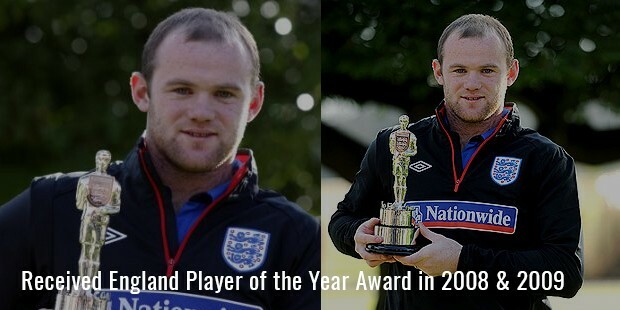 Rooney has also been a vital component of his national team England. In 2003, he became the youngest player to play for England at the age of 17. He made his debut in the Euro 2004 against Switzerland by scoring a stunning brace. This performance was crucial in cementing his place in the side. He is considered by many as the best player of the current England squad. As of October 2013 he has 88 international caps in which he has scored 38 goals. He has won the England Player of the Year Award for two consecutive years 2008 and 2009. As of 2013, he is the fifth highest paid footballer in the world with an annual income in excess of £ 25 million including sponsorship deals. He has gone from the being a teenage prodigy to becoming one of the most successful footballers of the 21st century.